Sometimes to appreciate what a movie is, it helps to consider what it isn’t. Room, the story of a young woman who’s held prisoner in a backyard shed along with her five-year-old son, could have been the sensationalized story of a deranged psychopath who kidnapped a woman when she was 17, sexually assaulted her, got her pregnant and continued to terrorize her. But Room smartly takes us into a world where the abnormal has begun to normalize. Born in the shed, the woman’s son knows no other life than the one he’s experienced in this ratty space. He’s seen nothing of the outside world except for the vacant sky that’s visible through a skylight in the roof. Otherwise, there are no windows, and the door has been rigged so that only the psychopathic jailer has the combination that can open it. Captured when she was 17, the boy’s mother sometimes negotiates with her captor, who shows up whenever he wants to sleep with her. He’s the boy’s father, but he barely acknowledges the child’s existence, and he obviously has no concern for the boy’s welfare. In their horrible situation, mother and son develop an unbreakable but sometimes difficult bond. Mom — known as Ma and played with great dexterity and determination by Brie Larson — tries to create a stable environment within an obviously perverse situation. She does her best to cope. She teaches the boy as best she can. For his part, Jack (an amazing Jacob Tremblay) is as normal as any child could be under such circumstances. He’s never had a haircut. He’s made to hide in a small wardrobe when the man — called Old Nick by Ma — makes his nocturnal visits. He’s always alone with Ma. Jack hears Old Nick and his mother talking, but can’t really understand what’s being said, a condition made frightening and confusing by director Lenny Abrahamson, who makes Jack’s point of view frighteningly real, a child in a world he can’t comprehend. You’re not wrong to think all of this sounds like the basis for a horror movie. But the brilliance of Abrahamson’s adaptation of a novel by Emma Donoghue, who also wrote the movie’s screenplay, is that Ma has made adjustments, even though she can’t ignore the terrible frustrations of living in a confined space (10 feet by 10 feet) that never was meant for human habitation. You get the impression, Ma never would have been able to survive without Jack, who has given purpose to her life. She’s intent on doing her best to protect him, and also to begin telling him about the world beyond the shed. Her motherhood can be both tender and fierce. I won’t describe the plot machinations any further because, if you haven’t read Donoghue’s novel, it’s best not to know much more. There are other characters in the movie. Eventually, we meet Ma’s mother (Joan Allen), the husband she’s acquired since Ma’s kidnapping (Tom McCamus) and Ma’s father (Bill Macy). Wisely, Irish-born Abrahamson, who directed the oddball movie Frank, offers only glimpses of Old Nick (Sean Bridgers). He focuses on Ma and Jack in ways that begin to illuminate both the love and claustrophobia of a mother/son bond, as well as the nature of a reality Jack is only beginning to comprehend. What he knows of the world beyond the shed comes from Ma and from the small TV left by their captor. Old Nick, at one point, buys the boy a toy, and he’s obviously left a few books and other things for Jack, but the movie never suggests that Old Nick has any capacity for empathy nor does it exploit his monstrousness for genre thrills: It stays within its mother-and-son frame. Ultimately, Room is a story about what happens when love is put to the severest of tests. Abrahamson credits us with enough intelligence to know that Ma has had no preparation for motherhood. Commendably, he doesn’t turn Jack into a poster boy for adorableness; the kid can get on your nerves. Unexpected and troubling, Room looks at what it takes not only to survive under horrific circumstances, but to love, as well. 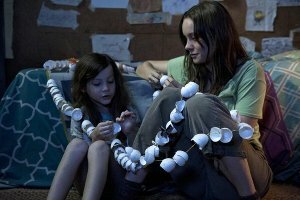 Room followed me out of the theater: I couldn’t entirely shake the uneasiness of the movie’s first half, and I don’t believe the characters ever will either. Room unbalances our world and makes it feel strange. Yes, there’s love and restoration — but there’s also lingering disquiet, the feeling that things can go so wrong that they never can be made right again. That’s what haunts you about this absorbing, plain-spoken and carefully calibrated movie.